Discovering nearby devices makes your app more physical, local and relevant. 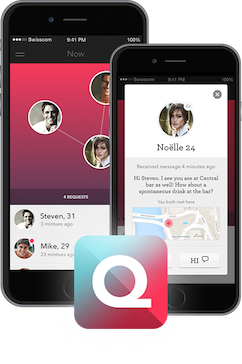 Imagine a dating app notifying you when there is a match nearby, or a networking app connecting you with people on the go. Estimate range to nearby devices. Whether delivering a package, redeeming a voucher or selling an item, proximity range estimation can help you verify whether the person in front of you is who he says he is. Exchange with nearby devices. Imagine a restaurant publishing its menu to nearby diners or professionals sharing their business cards with fellow attendees at events: p2pkit allows you to seamlessly broadcast content to nearby devices. 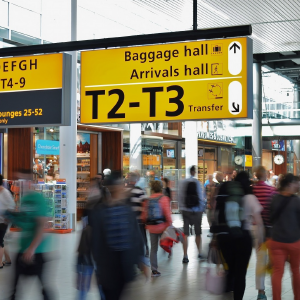 Granting access is twice as fast - p2pkit ranges and enables the verification of your guest as they approach the welcome desk - check in takes just seconds! You can welcome your guests by name - p2pkit discovers your guests approaching from up to 50 meters away -	personalize your service as never before! 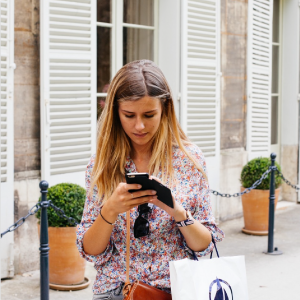 Your guests will never miss an important contact nearby again - p2pkit exchanges information directly from phone to phone - enable scanning for people that you don’t want to miss! 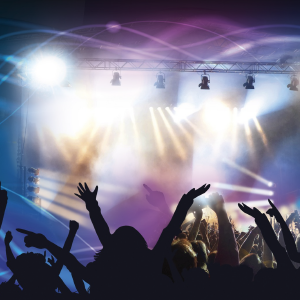 Whether you’re Eventbrite or any other event management platform, the MAKE OR BUY decision was never easier - your development team can integrate the SDK within minutes! Your users can interact with people nearby - p2pkit discovers users directly (phone to phone) - poke, post, tweet and date with real people, nearby and right now! Bringing the beacon experience to the outdoors - p2pkit proximity ranges events nearby with far better accuracy than GPS and at places where no beacons exist, thus turning smartphones into beacons! Your app starts learning from past discoveries - p2pkit analytics empowers users to connect based on their social graph and past interactions! Whether you’re Tinder, LinkedIn or the next big social media app, the MAKE OR BUY decision was never easier - your development team can integrate the SDK within minutes! Splitting the bill at a restaurant was never easier - p2pkit ranges nearby mobile wallets , whether known or unknown! Your app recognizes nearby people and places - p2pkit discovers phones or point of sale devices, lifting your digital product to a physical level! Simplify interaction between new users - p2pkit automatically detects users nearby, forget about entring email addrsses or phone numbers! Whether you’re Google Wallet, Apple Pay or the next mobile wallet or social payment app, the MAKE OR BUY decision was never easier - your development team can integrate the SDK within minutes! 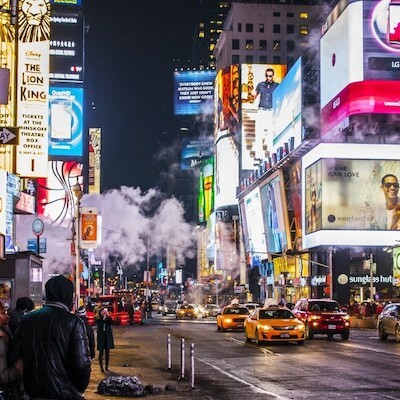 Your mobile ad campaigns enter the real world - p2pkit can turn smartphones into walking billboards, beacons for the street! You can provide timely, highly relevant content to those nearby - p2pkit allows you to engage consumers in a personalised way and at the right time via others! Increase the relevancy of your digital marketing - p2pkit enables you to drive on-site engagement with your brand, better targeting nearby customers! Whether you’re Reddit, Yahoo or the next big media house or an indie agency, the MAKE OR BUY decision was never easier - your development team can integrate the SDK within minutes! 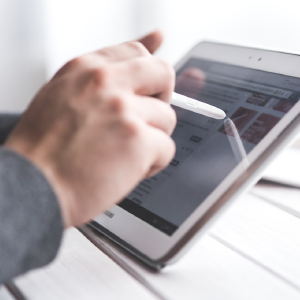 Receive personalized messages from any POS device - p2pkit exchanges relevant content directly from tablets or smartphones, increasing on-site customer engagement! Redeeming a voucher at a POS is simpler than ever - p2pkit discovers your payee within seconds, physical presence guaranteed! Buy and sell with nearby users - p2pkit allows the creation of new and exciting mobile p2p trading moments for your customers - start trading on the street! Whether you’re Criteo, RichRelevance, the next big mobile commerce platform or a loyalty card club, the MAKE OR BUY decision was never easier - your development team can integrate the SDK within minutes! Speedy deliveries that work without signatures - p2pkit ranges and enables the validation of recipients within seconds - physical presence guaranteed! Ticket checks are twice as fast - p2pkit discovers people nearby and allows easy automation of ticket checks in public transportation! Real usage and hyper-accurate person flow data is available - p2pkit allows you to measure the density of people in range: at speed, on rails, underground, and on the go! Whether you’re Ebay Now, the next delivery/logistics platform or a revolutionary transportation service, the MAKE OR BUY decision was never easier - your development team can integrate the SDK within minutes! 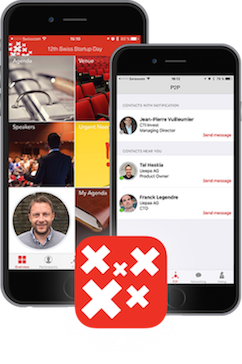 An event app developed especially for the Swiss Startup Day to enable proximity networking in real time. p2pkit added great value to the networking aspect of the event. With the novel p2p feature and the easy to use networking tool, participants were able to arrange meetings on the spot during the event. 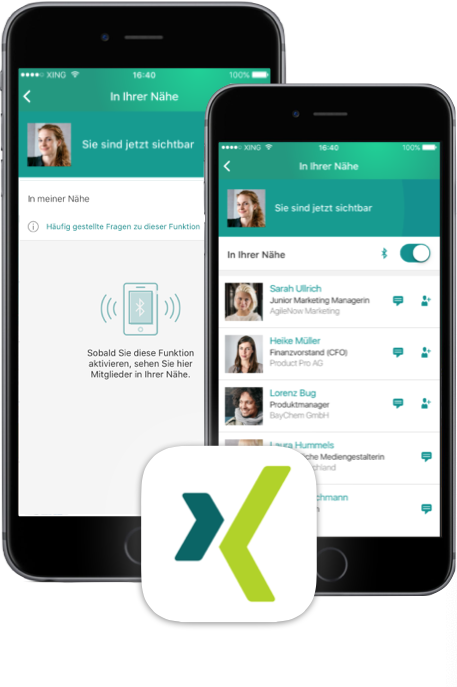 "In Ihrer Nähe“ ist über die Mitglieder-Suche in der neuesten Version der XING App zu erreichen. Sobald die Funktion sowie Bluetooth aktiviert sind, wird der Nutzer im Umkreis von etwa 15 bis 20 Metern für weitere XING Mitglieder sichtbar. Mitglieder, die die Funktion ebenfalls aktiviert haben, werden mobil angezeigt und können sich an Ort und Stelle vernetzen oder eine Kommunikation via XING Messenger starten. The p2pkit SDK allowed us to iterate quickly on a solution, which now enables XING members to easily connect with others locally. 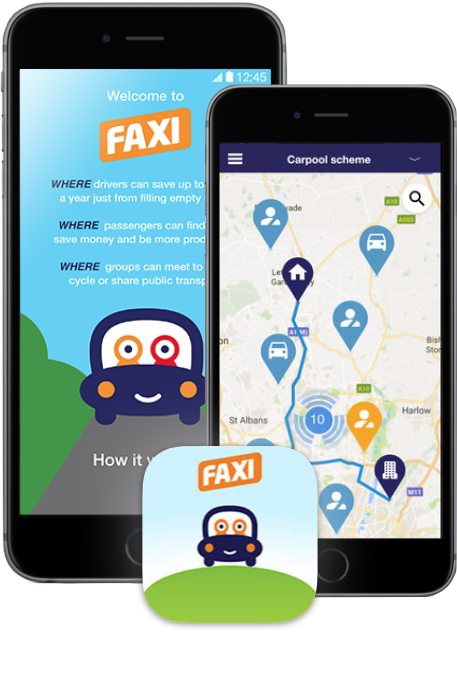 Faxi believes that sharing is caring, and can help reduce congestion, pollution, and save people money and time while providing safer and more efficient travel. Operation Outbreak (O2) is an innovative platform for STEM education on infectious diseases and outbreak preparedness created by Sarasota Military Academy Prep school and the Sabeti lab at the Broad Institute of Harvard and MIT. This platform integrates an academic unit covering relevant science and humanities subjects with a culminating “outbreak simulation” experiential learning activity. This activity replicates a real-world outbreak scenario and guides hundreds of students on how to respond through a coordinated effort and use of technology, teaching them biology and public health in the process. Of course, p2pkit was instrumental to enable the platform, so thanks again! Andres Colubri, Computational Researcher, Sabeti Lab. 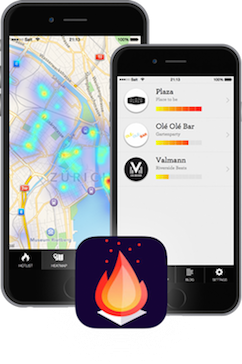 The HeatMap shows you the best clubs and bars in real-time based on the current activity level of your city on a map. Thanks to the unique peer-to-peer technology (provided by p2pkit) the Heet app is able to passively detect which, and how many, users are in the same bar - thereby generating a real-time heat map of where in the city is hot and not. The Magical Clock (Магичен часовник) by Makedonski Telekom (PKA. T-Mobile) is measuring quality time spent with family. Users can set daily, weekly and monthly challenges and goals. The app also provides tips and suggestions about current events and activities which would bring joy to every member of the family. p2pkit was a breeze to use, and enabled us to realize our ideas quickly and efficiently create a family-friendly social app. Reinventing the way people connect online. 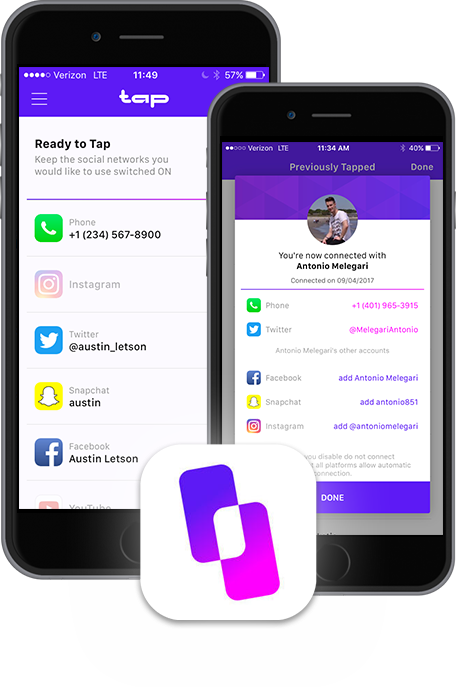 Tap allows users to instantly friend or follow new connections on multiple social medias and share customized contact information by simply tapping their phones together. p2pkit is a perfect solution to proximity detection. 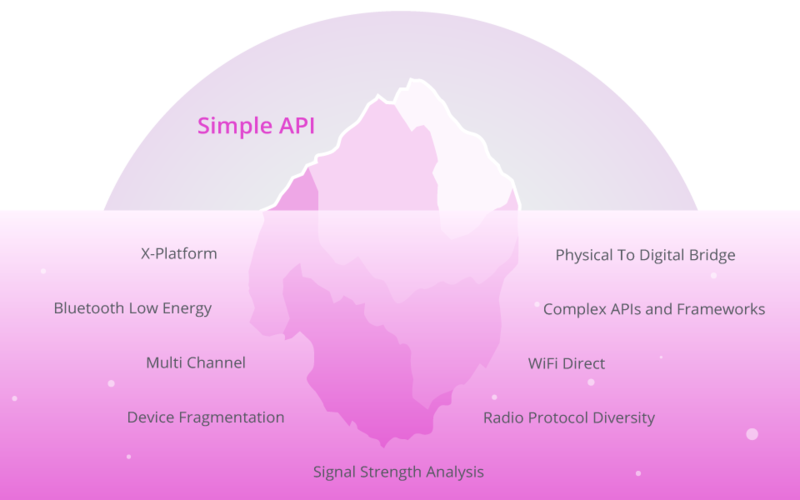 The powerful SDK allows Tap to intelligently determine which users to connect, making the end-user experience feel natural and intuitive. Stay battery friendly - your users will love you for that! // Tell your user about the new cappuccino offer ! p2pkit is compatible with iOS and Android and supports several radio technologies. It is very lightweight and hardly consumes any battery. You can configure p2pkit to beacon information (payload) to nearby devices who will discover each other and receive this information when in physical proximity. Nearby devices are notified when a proximity event takes place and receive the identifier, payload (optionally) and range estimation (when supported). Your app can then respond to this event in any way it chooses. For example: it can show a notification with a voucher for a coffee, the details of an ongoing delivery or the profile of that person you just met. When nearby devices update their payload or the range estimation changes, you are again notified and can take action. p2pkit is truly flexible!